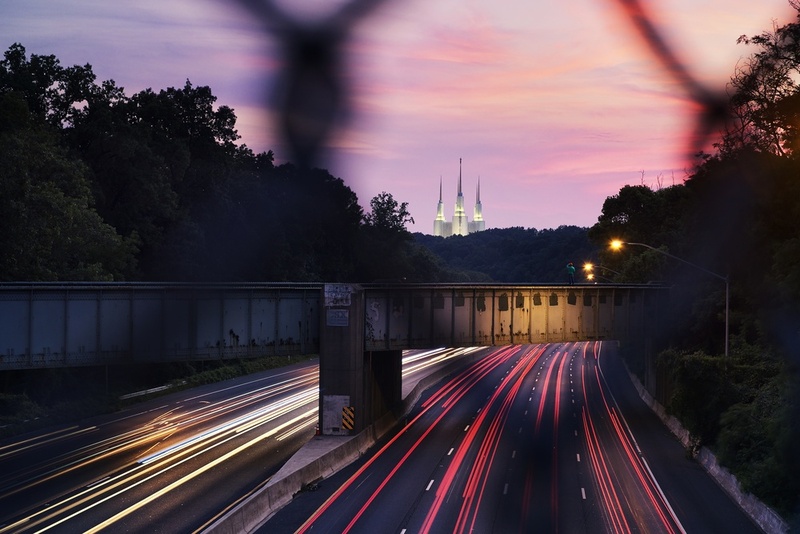 Growing up in the DC area, I have fond memories of driving by the Washington Temple. As young kid in the back seat listening to my folks sing Ray Charles' Georgia on my Mind since the Temple is located off Georgia Ave.
My sister and I would scream out in unison, "SURRENDER DOROTHY!" when passing under the rail bridge. There was always someone willing spray paint "surrender Dorothy" on the bridge and someone else presumedly finding it worth while to scrape off. Leaving the etched squares of missing paint. Only the "S" remains. The late night drives home from fencing were a hallmark of my youth. A contrasting experience after hours of the sounds of fencing, an empty and dark beltway allowed for such a calming ride home. The Temple would sprout out of the trees, glowing in the night's sky.